Russian,Criminal,Tattoo,GULAG,USSR,Prison,Russia,BMW,Criminal,Mafia,Vor V Zakone Blog about Russian Criminal Tattoo,Russian mafia, Russian Criminal Tattoo Photos,Meanings of tattoo,Vor v zakone,Stars,Criminal,Mafia,Eastern Promises Russian criminal tattoo: Book "How to survive and spend time usefully in prison"
Book "How to survive and spend time usefully in prison"
Today i start post translate of one book about russian prison. 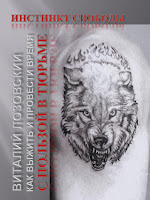 This book called "How to survive and spend time usefully in prison" and was wrote by Vitaliy Lozovkiy, owner of site about russian prison www.tyurem.net. About him and life in russian prison in his book. I should say that I didn't mean to write a book about prison. I had a desire to share my world views thus getting rid of annoying memories associated with imprisonment. So Internet mailing "How to survive and spend time usefully in prison" was born. Interest to it exceeded all my expectations - about 2000 people subscribed to it immediately. Today the total number of subscribes is around 20000. The letters started coming, and two more mailings appeared: one for questions and answers, another - for prison stories from other authors. The site www.tyurem.net was developed. Thus the fate dragged me to the moment when I couldn't help publishing the book - I found it already written without me noticing it. The history of the book writing has dictated a bit unusual for book stylistics and form of narration - the author's text is mixed with the readers' questions, notes, remarks, responses (not always positive) and the author's answers to them. What can I do - Internet enters actively our life. It goes without saying that letters are needed. When one reads published letters everything is pictured so realistically that in some moments "the hair stands on end". I am an ordinary engineer. I knew about prisons and prisoners only by films and books. And I always thought that everything happening in the prisons is within the law, yes, there are some "excess" but not to this scale!!! And what is described in letters is just a NIGHTMARE!!! I'd like to know TRUTH but exactly "firsthand"! You, possibly, think that I am one of those who just want "bread and circuses" but this is not so. What you are writing about is TRUTH OF LIFE! And thanks to you and to your authors of letters! But there was the evident advantage in this form of writing: each next chapter was written under the influence of the readers’ feedback. They expressed their wishes and made evaluations thus suggesting me correct direction and style. Statistics of the number of subscribers, that, sometimes to my surprise, was growing constantly, was assuring me more and more that I did necessary thing. And thanks to everybody for this. Sometimes there will be repetitions of phrases or descriptions of events - please, don’t judge strictly. This is a side effect of the interactivity I mentioned above – conversations on different sites, by mail, in different time, with different people. This edition also includes several chapters and abstracts that were not published before and they were written in the process of the book preparation for printing. Vitaliy Lozovskiy’s work is an attempt to systematize prison knowledge that has no analogues. And I should say immediately - this attempt is successful, with outstanding result. Complexity, closed nature and inaccessibility of the prison life for study as the Mars planet for a long time kept it in frightening uncertainty while according to various estimations from every fourth to every tenth of the CIS resident either was or is in the prison. There was a need for the experience of the person who passed though the repressive system of the post-Soviet prisons and prison camps in combination with the author’s analytical and summarizing talent to demonstrate the dreadful parallel world in which, unfortunately, everybody can have a place. Photographic presentation and truthfulness of the material is confirmed by numerous participants of the discussion the author arranged in Internet. Vitaliy’s work has no weaknesses as a result of the fact that the author having passed through the prisons and the prison camps, being direct participant of the events, has remained an attentive observer and everything he writes about is truth. Lozovskiy’s book opens the road for scientific, social and philosophic researches of the prison life and the prison inhabitants whereas the human rights aspect manifests itself and becomes one of the main aspects of this multidimensional, complicated as the prisoner’s life labor that can be hardly overestimated, as it is also impossible not to foresee burning interest of the reading public to this work – to the unique work both by its content and form, the first one of this kind. This book will be the reliable assistant on the way to life and freedom for each prisoner and free person either he gets to the prison by himself or as a result of absence of the legal framework in the post-Soviet territory or he won’t get there at all. Good luck, Vitaliy.